I’m sure that most of our Geek Priders are familiar with one of the latest crazes to hit the masses, which comes in the form of boxes of wonderfully geeky goodies delivered straight to your doorstep. Well, forget SuperLoot and My Geek Box, I’m here to review the new box on the block, Lootmonster. 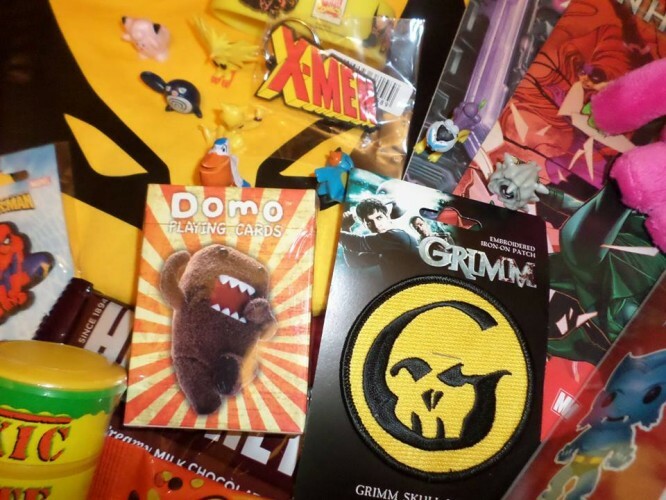 Lootmonster hit the web last month, releasing the first of their fabulous monthly boxes for September. The website allows customers to sign up for a 1, 2 or 3 month subscription starting at £24.99 per month with discounts for a multiple month purchase. 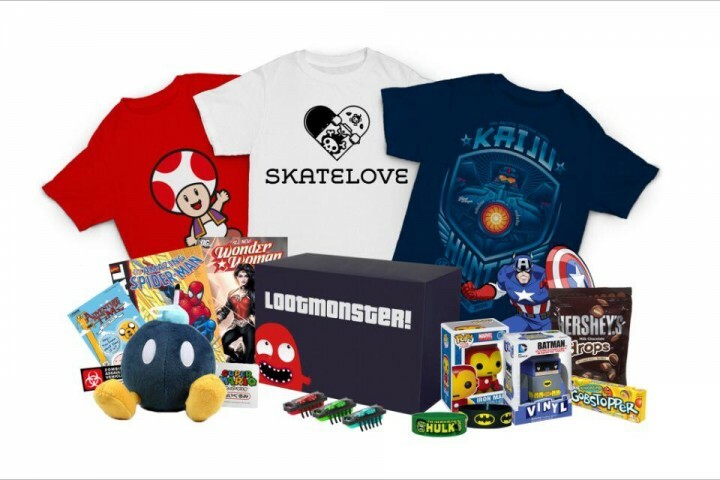 Lootmonster’s ‘Mystery Box of Pure Awesome’ contains a limited edition t-shirt, 7-10 mystery items and free delivery. Once a month, one lucky subscriber will be chosen at random to receive a ‘Megabox’, head over to Lootmonster’s Facebook page for more info on that, it really is a beast of a prize. They’re also giving away an Xbox 360 and copy of Minecraft for the lucky winner of October’s Megabox, which is pretty darn swish. I was lucky enough to grab one of September’s boxes, which sold out rather quickly. I’ve never ordered one of these mystery box type creations before, so I was rather excited to be greeted by a lovely big box from the postie. With a cute note which promised a few extra items for subscribers for the first month, I was certainly not disappointed at what I found inside. Firstly, there were Pokémon. Everywhere. Each time I picked something up out of the box I seemed to be greeted with an adorable little figure. All of the love for these fellows. This month’s t-shirt was a fabulous Wolverine design, along with other X-Men goodies such as an awesome Beast Funko Pop!, keyring and wristband. Funko figures are always popular, with hundreds of different characters now available and lots of folk collecting them, myself included. 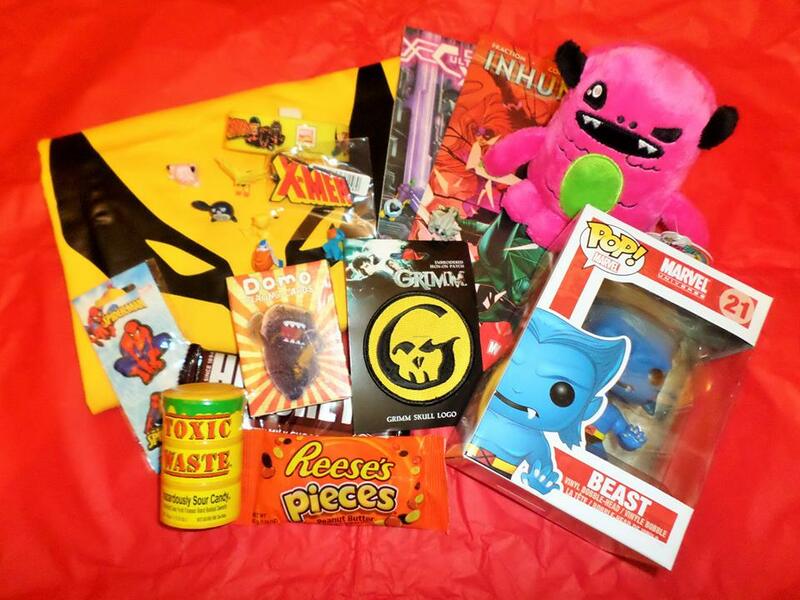 The box also featured a charming little monster cuddly toy, a couple of comic books, Spider-Man fridge magnets, an iron on patch, some nommy treats and Domo playing cards. I loved the cuddly monster and there were some great little items as well. Along with ALL of the Pokémon. Well, not all, but there were plenty of the little cuties. So, can you guess this month’s theme? I really enjoyed my Lootmonster box and one of the main things that I noticed, along with friends that I showed the items to, was how incredibly varied the box was, despite following a theme. Whilst not being a huge X-Men fan myself, there was plenty for me to enjoy, along with delighting my young nephew with a few of the goodies. I could happily order a box as a gift for a friend or treat for myself, knowing that the items would be so varied and there would be something for everyone. It also encourages people to broaden their interests, particularly through things like the comic books. I received a copy of Cataclysm Ultimate Comics’ X-Men, along with Inhumanity. I’m not familiar with either, but will definitely be giving them both a read. In regards to cost, Lootmonster is a little more expensive than a couple of competitors, but that extra cost is definitely reflected in the quality and quantity of items received. It’s more than worth the £24.99 (which includes free and fast delivery) and the shirt and Funko alone would probably cost that. Customers are always guaranteed a shirt and 7-10 items, so it’s well worth the price and what you don’t want, you can always put towards folks’ Christmas presents. Sorted! Orders for October are now available with 16 days left to subscribe. I’d be pretty hasty about it mind, as September did sell out rather quickly and you wouldn’t want to miss out. As a very happy customer who popped her geek box cherry to Lootmonster, I’ll definitely be subscribing for October and can’t wait to grab my geeky goodies.